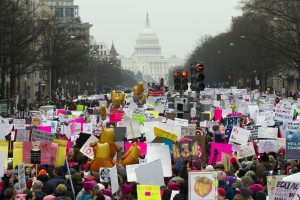 WASHINGTON — Amid internal controversies and a capital city deeply distracted by the partial government shutdown, the third Women’s March returned to Washington on Saturday, Jan. 19, 2019 with an enduring message of anger and defiance aimed directly at President Donald Trump’s White House. 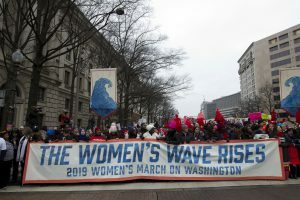 As it turned out the weather was chilly but otherwise pleasant, and the mood among the marchers a now-familiar mix of sister-power camaraderie and defiant anger toward Trump and the larger power structure. As always the Trump administration was the direct target of most of the abuse — with fresh bitterness stemming from more recent events like Supreme Court Justice Brett Kavanaugh’s successful confirmation last fall despite a direct accusation of sexual misconduct when he was in high school. In Denver, protester Jacquelynn Sigl said it’s a mistake to focus solely on Trump. Preparations for this year’s march were roiled by an intense ideological debate among the movement’s senior leadership. In November, Teresa Shook, one of the movement’s founders, accused the four main leaders of the national march organization of anti-Semitism. Shook, a retired lawyer from Hawaii, has been credited with sparking the movement by creating a Facebook event that went viral and snowballed into the massive protest on Jan. 21, 2017. In a recent Facebook post, she claimed Sarsour and Mallory, along with fellow organizers Bob Bland and Carmen Perez, had “steered the Movement away from its true course” and called for all four to step down. Despite pleas for unity, the internal tensions were most keenly felt in New York. An alternate women’s march organization held a parallel rally a few miles away from the official New York Women’s March protest, and one activist actually disrupted the main protest.